I still like Xavier when he is written well. I do not believe he should be apologetic for making decisions in the past. He had no rule book and not a lot of trustworthy help around him at that time. And now, Scott is stuck in a position where he is having to make hard choices that he does not like. Between the two, I like when Xavier is strong and lets loose with the most powerul mutant mind on the planet( a few times removed now). As for Scott, he has abandoned one wife and cheated on the other. I have never cared for him much as a character, but I like him with Emma... but do keep in mind that he does have a wandering eye when his ladies turn too cold(poor Jean and now maybe Diamond Emma). Strategically, Xavier is at his best when teaching mutants how to use their power. And I am not sure if he is being used well in that capacity. Come on writers. And is it just me, or does it never seem like a good idea to concentrate all the mutants on one big target? That's a really good point about all the mutants in one spot. Though you could counter-argue that it makes it easier to defend all the remaining mutants if they aren't wandering all over the place. But honestly, I'm with you on this one. If they're spread out, to the four corners of the globe, then it would be hard for someone like, say Stryker (who I believe is dead, but I'm using him just as an example) to wipe them all out in one fell swoop. It would take an operation of some considerable manpower quite a while to figure out where each was, and take them out. Kind of a guerilla man/mutant war. anyone following this book? What's Magneto getting up too? Anything I'm missing out on by not following this? I finally dropped it this year. It was starting to suffer from having too many mutants in it. I find it ironic that there are so many mutants on this island but in the 3 or 4 X-books that are out there they only show the same 5 or 6 characters. I'll probably pick up any issues that crossover with the upcoming Second Coming storyline since it has to do with Cable and Hope returning from the future. I still read it. I think Fraction is doing a fine job. Mags is forming an alliance with Namor on behalf of the mutants on the island, and is taking orders from Scott pretty well...for now. The island was sinking, but Magneto got Namor to re-settle Atlantis beneath the island, and create a column that supports the island and gives them protection. Dangit! I may have to start buying this again. Fraction finally wrote the X-Men in the way I enjoy them. Love the way he brought Kitty back (not really a spoiler since it says it on the cover) and I loved the Whilce Portacio art. Kitty Pride tends to be the heart of the X-Men and I hope she gets a proper treatment by Fraction. Nice way it didn't wrap up nicely and built some drama for future stories. And how about Magneto? Is there anything his power can't do? Screw that, Jeff ... you state "issue #522" right at the start of your post ... spoil me. How did Kitty come back? ok - that was overkill. Mag's goes up to the mountain top and basically goes into a trance and literally pulls the bullet back to earth with his powers. He doesn't tell anyone what he's doing so everyone's kind of freaking out. But once they realize they go to a lot of trouble to hide the bullet from satilites, etc so as not to cause a panic. Funny scene - they get a call from Reed Richards where he says "uh..what are you guys doing? You can't hide anything from my satelites" Once the bullet gets back, Mags rips it apart and slowly lowers Kitty to the ground. BIG SPOILER - she goes to hug Colossus and phases through him. She's been phased for so long she can't un-phase back. Story ends with her in what looks like a bacta tank from Empire Strikes Back. Mag's is in a coma from overdoing it with his powers. That synopsis didn't do it justice, of course. Really good issue. Coming out tomorrow, April 7! The race to find Cable and Hope is on, but who will get to them first? 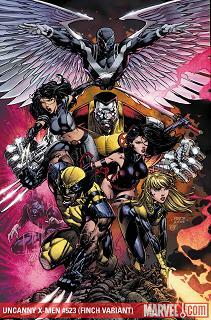 Will it be Cyclops and the X-Men or Bastion and his mutant-hating cabal? 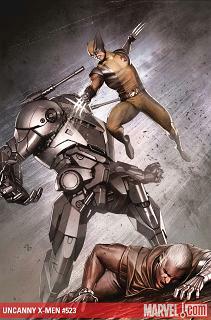 Cyclops isn’t waiting for the answer to that as takes the fight directly to Bastion with the New Mutants! POST COMMENTS IN THE X-MEN SECOND COMING THREAD - HERE! 'QUARANTINE' Part 4 (of 5)-The public gets what the public wants - and the public wants 'X-Men.' The Sublime Corporation is here to provide, at a cost. Both financially and for the safety of the entire world. It's the gala product launch that everyone will be talking about. If only the actual X-Men weren't dying of the power-sapping flu on Utopia so they could stop this. 32 PGS./Rated T+ Cover price $3.99. So ... I knew this would happen (thanks a lot F'n X-FACTOR !! ), I am now thinking about adding UNCANNY to my pull and was wondering if the team of Fraction/Gillen has been any good? I flipped through the last issue at the LCS and it looks to be pretty good, even with the Land art. Worth adding now and tracking down the Quarantine arc? It's not bad but because of the Land art I would say not a must read. I'm not a fan of the whole Utopia thing in San Fran but what they are doing with Kitty, Emma, and Fantomex is interesting. Land's Dazzler is awful. Looks nothing like like she should and she always has that stupid posed grin. Yeah, not a fan of Land, but the first few pages of 533 looked bearable. So weird that when I first really noticed him, on CrossGen's SOJOURN, I really liked the look .. and then after about 4 issues ya just really get tired of the copy-pasta. Still have to get my friends copies of X-Force 3 ... (and 4?) to catch up on PhantomX. Not bad at all ... damn it.